Balanced scorecard system has received a huge portion of criticism. But who are Those critics? Well, these are mostly top managers and business owners who have a negative experience of BSC implementation. The problem is that balanced scorecard becomes the most effective strategic management tool only if a number of norms and conditions are observed. It has turned out that balanced scorecard can be used in a variety of ways. It would be wrong to say that some ways to use balanced scorecard are correct while others are not. But at the same time, balanced scorecard is above all strategic management tool, but not just another system of accounting and managerial control. Balanced scorecard helps to start a broad discussion in the company. Balanced scorecard should become company philosophy. There are two types of companies: those that have tried Balanced Scorecard and either gave it up or use it as system of managerial control, and those companies for which Balanced Scorecard became an inseparable part of everyday routine. Such companies are unlikely to part with BSC. But there is one condition for successful use of balanced scorecard. Company personnel must be involved in development of strategy maps and in everyday use of BSC. The problem is that sometimes top management is far far away from company customers while ordinary front line employees know everything about those people who bring money for the company. That’s why ordinary employees must understand their contribution to implementation of strategic goals. In other words, they should know how their work affects company success. Employees must be well motivated. As known, financial motivation proves to be one of the most effective systems of rewarding employees. 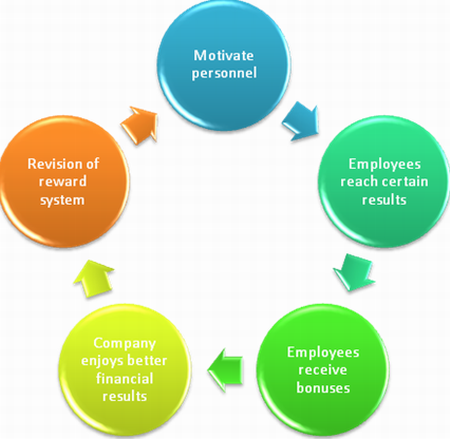 But very often companies develop incomprehensive reward systems. On the one hand, employees may be not satisfied with the compensation and bonus systems. On the other hand, the company may simply be paying bonuses for completion of the wrong goals. For example, when measuring business productivity, company employees in sales department may be getting bonuses for number of contacts with customers or visits paid to customers. This leading indicator is very important. But at the same time it does not guarantee that all those potential customers will be buying from the company. So, as sales manager is not interested in sales but he wants to make as many phone calls as possible. Formerly, he will improve his performance, but in fact the company will not benefit from it. Just to the contrary, it will pay such as sales manager bonus for a certain number of phone calls.